Hotpoint is offering one lucky reader the chance to win a brand new washing machine, worth over £600, which makes the chore of laundry incredibly easy. The clever Drive Me feature removes the hassle of selecting the right wash programme. Just select the fabric type and dirt level of the garments and the machine will choose the best programme to ensure everything is clean, whilst also protecting your garments. The appliance will also help save on your household bills, thanks to the outstanding ‘A+++-30%’ energy rating. Low water consumption is achieved by Eco Rain technology, which sprays water on top of the clothes, like a shower, rather than soaking the clothes in litres of water. This feature ensures that only the optimum amount of water and energy is consumed, making it easier on the pocket too. The Hotpoint Ultima washing machine removes more than 100 stains, including coffee and grass, at 20˚C, whilst keeping colours and fabrics safe. The washing machine provides outstanding cleaning results by using Direct Injection technology. The washing detergent and water is pre-mixed before entering the drum and is injected directly into the wash. The detergent penetrates the clothes faster and the cleaning power is increased by up to 60 per cent*, ensuring outstanding deep cleaning results at a lower temperature. 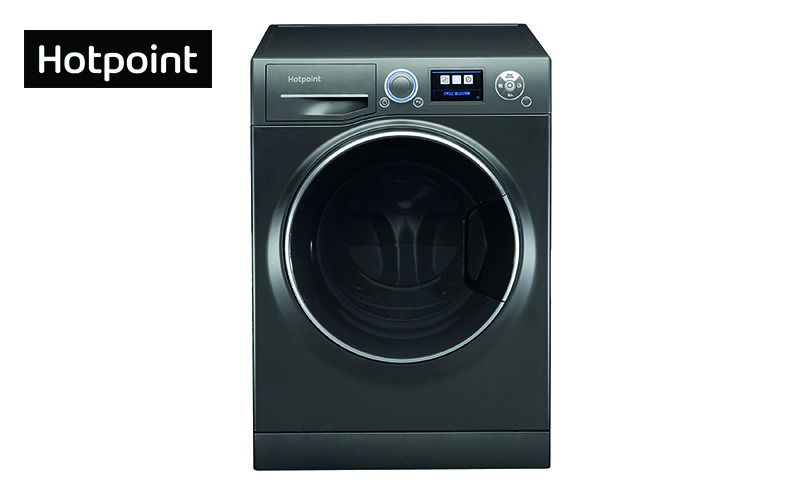 Enter now for a chance to win a brand new Hotpoint Ultima washing machine.